By Mark - Argentina - 25 Oct/02 - Viewed 1991 times. Before we came to El Calafate we had never heard of El Chalten, but it is well advertised around the town so we looked it up in the guide books. The Footprint book says "there are stupendous views and anyone within 500 miles would be a fool to miss them". A quick check showed we were only 230km away. El Chalten is a base for trekking in the beautiful National Park of Glaciers and has some very distinctive peaks, one of which the town gets its name from. We bought an open return from the hostel for A$80.00 each. The bus picked us up from the hostel at 7am, but five minutes later dropped us at the front of the bus station in El Calafate. We then walked through to the back of the bus station while the bus drove round and we all got back on. Don't ask me why. The road to El Chalten is not paved, so it was a bumpy five hours later that we arrived to be greeted by torential rain and high winds. There are several buses to the town that are run by different hostels, so each bus drops you at their hostel. Our bus went to the Hosteria Fitz Roy. I don't know if they decided to up the price as a gamble that we wouldn�t walk anywhere else in the rain, but for some reason they were three times more expensive than anywhere else (A$185.00 for a double!). Basically they were charging in US dollars what they should have charged in pesos. It didn't even look that nice. Needless to say, everyone on the bus headed out into the rain to look for somewhere else. What seemed like hours later, we got to the Rancho Grande hostel, which we knew to be sensibly priced from other travellers (later we realised we had only walked about 20 metres). A double cost A$65.00 and there was a nice bar and kitchen. When the rain abaited about 6pm we went for a walk around the town. Even in the height of summer it is a very small town, only founded in 1985 to serve as a base for hikers. In spring when we were there, absolutely nothing is open. One shop opened about 6.30 for a bit, but didn't have much to sell. Luckily we had been forewarned by some other people, so we had brought enough food for two days. The hostel does serve hot meals in the bar too, but nothing you can take with you trekking. The next day was sunny, so we set out on a six hour trek. There are a number of marked trails and a few you have to do with a guide and require special equipment. There are also campsites you can stay at so that you can hike from them the next day and get further into the mountains. The first hour and a half was steep but amazing as the weather was good and the views over the valley were stunning. After that, the clouds came down so we couldn't see the big mountains. Finally, the last half an hour it started to snow. We got back to the hostel and had a submarino (hot chocolate with a lump of real chocolate at the bottom) and a beer (two-pint bottles only A$5.00). We cooked our own dinner and ate it in the bar. The next day started just as nicely, only now there was a couple of inches of snow on the ground. We started early in case the weather deteriorated. It was really amazing walking though the mountains with all the trees dusted with snow and the sun shinning. This trek also started steeply and rose to the highest point after an hour and a half. From there it was a further hour and a half along a small valley to lake Torre which is fed by a glacier. We only had half an hour there to eat our lunch before we had to start the three hour trek back because we were catching the bus back to El Calafate at 5pm. On the way back, the last remaining clouds around the highest peaks lifted so we could see them. It was so nice in the sun that we didn't want to leave, although we were far to tired to stay and do more trekking without a rest first. So, back to El Calafate (which seems like a huge metropolis after El Chalten). 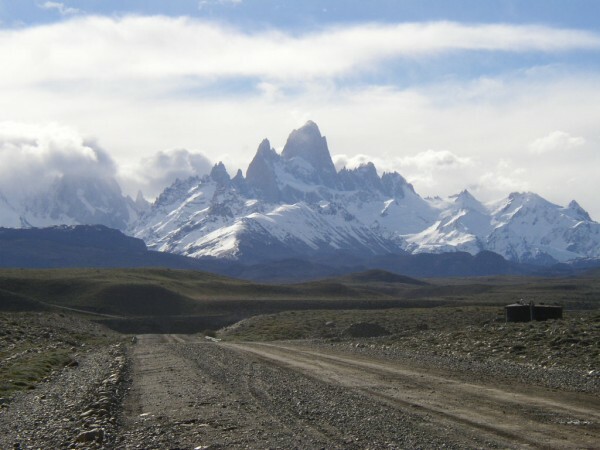 Next we are going to try to get a bus to Puerto Monte in Chile, to do more trekking in the Torres Del Paine National Park (if we have recovered).